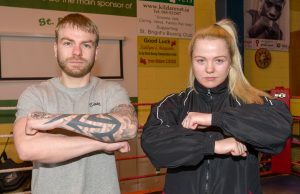 FROM the moment that ‘Clash of the Titans’ was announced and Allan Phelan was thrown into his first professional title fight the event in the National Stadium on Saturday evening was always going to be a big night for the boxing mad Phelan family. But then Allan’s younger sister Katelynn announced that she was turning pro and was added to the bill and the event went off the scale for what it means to the Phelans. Boxing is not just a hobby or a pastime for the Kildare Town family, it’s a way of life. Father, Paddy, has grown the St Brigids Boxing Club from humble beginnings into one of the best clubs in the county, and even the province. He’ll be leading the cheering for his two children, alongside his wife Martina, at the packed arena and while the nerves and excitement are palpable among the parents, Allan and Katelynn are just looking forward to getting down to business. Allan turned professional at 18 and the first nine of his 13 fight pro career were in America. 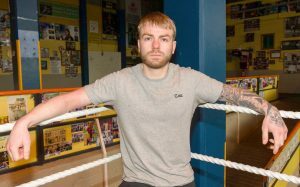 He returned to Ireland for his first pro fight in his home country in 2017 but after four fights that year, it’s been a frustrating spell since with fights falling through for a variety of reasons. He never lost faith though and continued to train hard under the watchful eye of Paschal Collins in the Celtic Warrior gym. That patience paid off when he was added to this huge night in a match up against Aiden Metcalfe for the vacant BUI Celtic Super Featherweight Title. “It’s the sort of fight, and night, that I wanted to be involved in when I came back to Ireland. Boxing in Ireland is starting to up its game, especially with TG4 coming on board to let viewers see the skills of boxers in Ireland. It’s definitely one that is going to push me up there, I just have to get in and perform,” said Phelan, now 27. “This is what I wanted. I want to keep stepping up and start winning belts. I’m in the game a long time now, I’ve been in America so now is the time to move forward. Training has been going really well, I’m getting good sparring. It’s just about performing on the night,” he added. It would have been easy to drop the head or let his motivation level suffer after such an extended period out of the ring but Allan was always convinced that his time would come. “Travelling up and down to Dublin for training can be a pain in the arse, I’m up there twice a day some days. You have to look at the brighter things though, it’s about putting the ground work in and seeing the bigger picture. All the lads in the gym have their own big fights so we are all driving each other on,” said Phelan. Phelan’s title bout with Metcalfe is one of a number of domestic bouts down for decision on the night and it is sure to lead to the sort of atmosphere not experienced in the National Stadium for a long time but he won’t be getting carried away and will be relying on his team to come up with the winning gameplan. “I don’t know anything about him to be honest. I’ll just focus on myself and let the coaches look at him. I’ll just go in with a plan and execute the plan and everything should be 100%, I just want to get in and be the best I can be. “He’ll have his crowd, he wants this title, he’s 100%, I’m 100%. I know myself I have the beatings of him and 100% I am not leaving that ring without that belt. I have a gameplan, I will execute it and I am the one who will come out victorious on the night,” said Phelan. As the protective older brother, he will try his best to catch his sister’s fight on the night but whether he does or not he is confident that she will excel too. “It’s a big thing for the family with Katelynn turning pro as well. There’s a lot of people coming from around the town here so it will be a hectic one, I’m sure the tv will enjoy the shouting from the fans. “Me going for my first belt was big enough but Katelynn fighting on the same night makes it a lot better. I think it’s the first show with a brother and sister fighting on the same night, you don’t really hear of that. It’s a huge occasion for the family, we’re making history. Not many people can say that and the two of us just have to get out and execute the game plan and it should be a victorious night for all of us. “She is doing really well. She is listening and working hard and is doing really well. She is excited, nervous and excited. It’s a big step for her, she is still only young but I can’t say too much about that because I was very young when I turned pro myself. I’ll try pass on whatever tips I can give her,” said Phelan. THERE was never much chance of Katelynn Phelan being anything other than boxing mad. Her father and brother were bitten by the boxing bug long before she laced up a pair of gloves but as soon as she was old enough, she wanted to be just like them. “I was six when I started boxing and I am nearly 19 now but the whole family is involved. I’m in here training in the club everyday, twice a day. It’s great fun when Allan is here training, he makes me cry a lot!” laughed Katelynn. It might be fair to say that the boxing bug is endured rather than enjoyed by mother Martina who suffers more from nerves than the rest of the family. “My mother can’t sleep already. About a month out from the night, when we found out, she wasn’t sleeping because of the nerves,” said Katelynn. 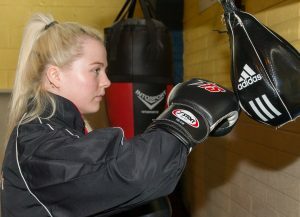 A decorated underage boxer, Katelynn caused a huge stir when it was announced that was she becoming Ireland’s youngest, by a distance, female boxer. Most girls her age that step into the ring are dreaming of Olympics medals, and that was Katelynn’s goal at one stage but she had a change of heart. “I could have dropped weight to make the Olympics. When I was younger that was my dream because I heard everybody talking about it but once I started to think for myself I found that I didn’t really want that, I wanted to turn professional and I wanted the belts around my waist. People might think I’m stupid for doing it but what can you do. “I am the youngest female professional, the others are over 30. I’ve wanted this for years and I’ve seen my own brother do it so it’s something I’ve always wanted. Then there is the likes of Katie Taylor. You see all these females moving up the ranks but none of them are young so I think there is an opening there and I know I am going to make it,” said Katelynn. Saturday offers her the perfect chance to show off her talents to a wider audience. “I’ve been all around the world with boxing. I was in India there last year and boxed in front of a sold-out arena that was three times the size of the National Stadium. I’ll still get nerves on the night though, that’s only natural. “I’m boxing a Polish girl, she is 31 and has 14 fights. She knows what it is about. “I want to get as many fights and be on as many shows as I can, club shows, anything really. Anything we can get we will take, no matter who it is against. Short term, I want to get the fights in, build my record and get the numbers high. Long term, them belts, they are going to be around me as soon as possible,” she said. Phelan looks up to a lot of female boxers for inspiration but one day hopes that the next generation will be looking up to her. “It’s great seeing more females in the sport, Amy (Broadhurst) just won her fifth European title, that’s unbelievable and there’s Kelly Harrington as well. There are all these amazing females out there to look up to and hopefully I’ll be able to join them and be somebody that the smaller kids look up to,” she said. What a night is in store for the Phelan family.